Continuing the “Showcase Presentations in…” series, we now present: Austin, Texas. An overview of each cinema will be provided in a forthcoming revision. This project excludes IMAX and other Special Venue presentations. (They might be added in a forthcoming revision.) Pre-1950s era roadshows have also not been included. 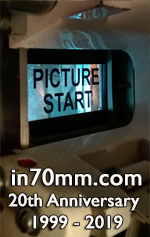 Regarding image: To simplify the layout and presentation of the information, no distinction has been made between those movies originated in 70mm (65mm) and those originated in 35mm and blown up to 70mm. Such details can be found in numerous articles and reference material elsewhere on this website. Regarding audio: The majority of the titles featured in this chronology showcased some flavor of six-track stereo. (The noted 35mm presentations used in some roadshow situations were often 4-track magnetic stereo or, in some cases, standard optical mono.) The 70mm prints issued from the late 1970s typically were encoded with Dolby Noise Reduction and often included “baby boom” low-frequency enhancement and occasionally split surrounds. Most of the recently-struck prints featured digital sound (DTS aka Datasat). The reserved-seat engagements have an asterisk after the applicable title. Note that some of the presentations included in this listing were presented in 35mm during the latter week(s) of their engagement due to print damage and the distributor’s unwillingness to supply a 70mm replacement print or because the booking was moved to a smaller, 35mm-only auditorium within a multiplex. As well, the reverse may have been true in some cases whereas a booking began with a 35mm print because the lab was unable to complete the 70mm print order in time for an opening-day delivery or the exhibitor negotiated a mid-run switch to 70mm. In these cases, any 35mm portion of the engagement has been included in the duration figure. Also, regarding roadshow presentations, the reserved-seat policy, in some instances, was relaxed during the latter portion of the run. References: Various issues of Boxoffice, Austin American-Statesman, The Austin Statesman, and Variety; Dolby sound system installation records; and projector and sound system trade advertisements.